As days get cooler in the fall, it’s time to move indoors and freshen up your living space. We’ve put together a collection of fresh new fall decor that makes a perfect setting for fall baby showers, fall bridal showers, fall birthdays and more. 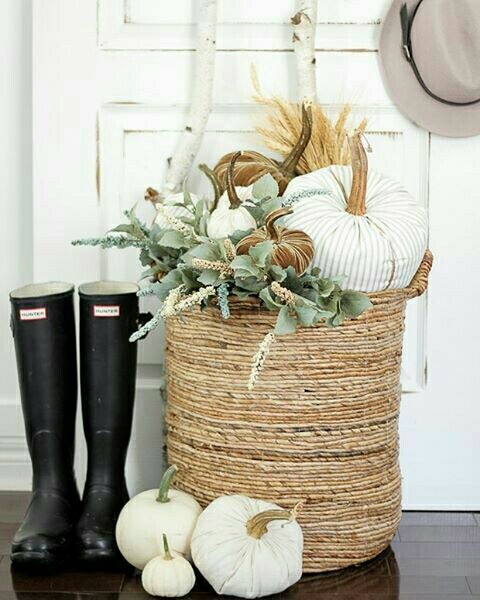 Today’s fall decor doesn’t have to be over the top with orange pumpkins and witches. This year’s freshest looks feature muted tones, the injection of soft greens and blues and a bounty of woodland creatures. Start by playing off the colors and imagery in your fall invitation and then you’ll have great decor for your party and all season long. 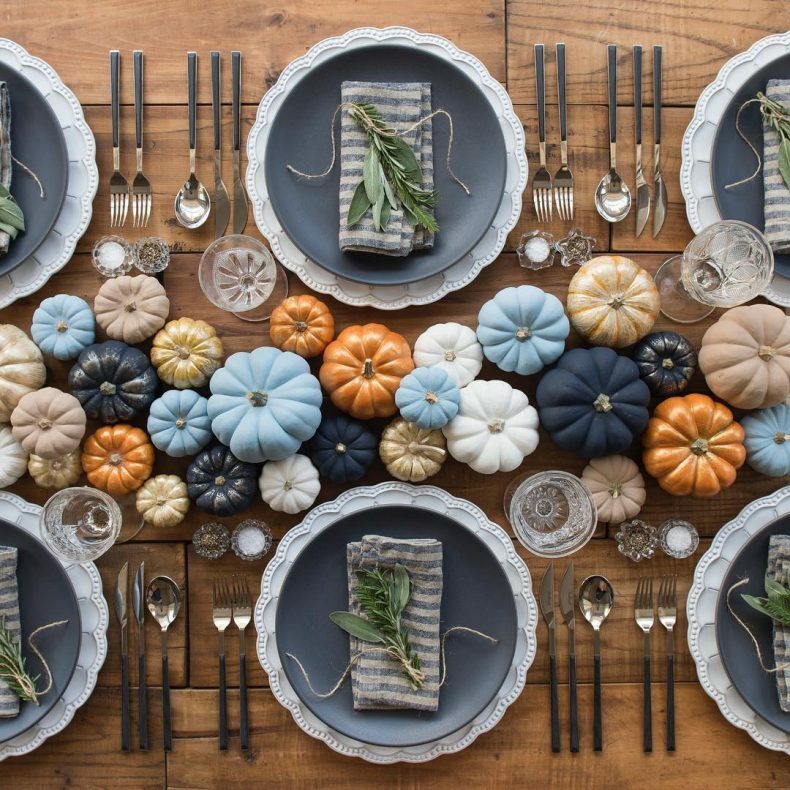 One of our favorite trends this fall is the prevalence of heirloom pumpkins in decorating. 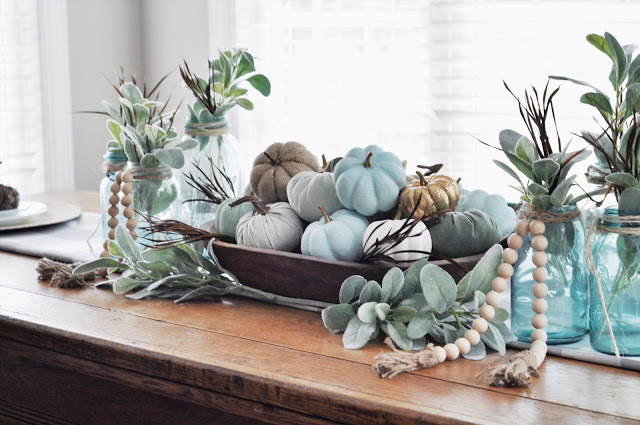 They are oh-so unique and individual and add a charming and modern twist to your fall decor for any party you plan to host. 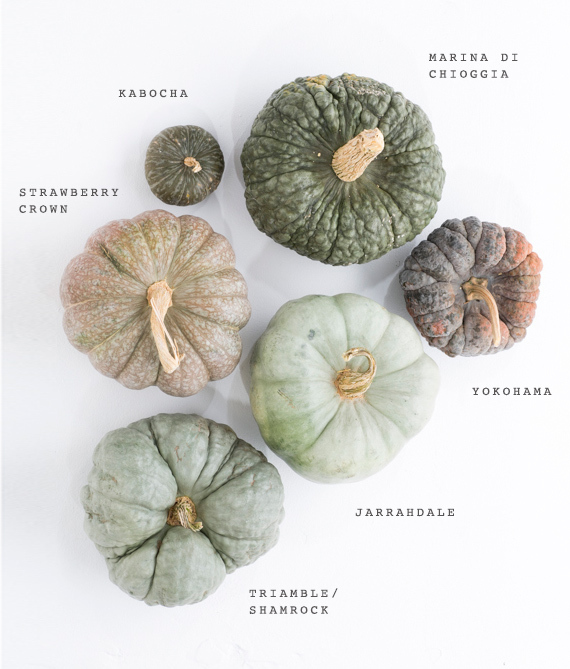 100 Layer Cake gives you an overview of some of the most popular varieties of heirloom pumpkins with gorgeous shapes, sizes and unique colors for your decor. On a budget? Not to worry. Target has $1 velvet pumpkins in it’s Bullseye Playground that mimic the shape and soft green colors of several varieties of heirloom pumpkins. These, featured in a breakfast nook display by Belle On a Budget look so inviting and cost less than $30 for the entire look. 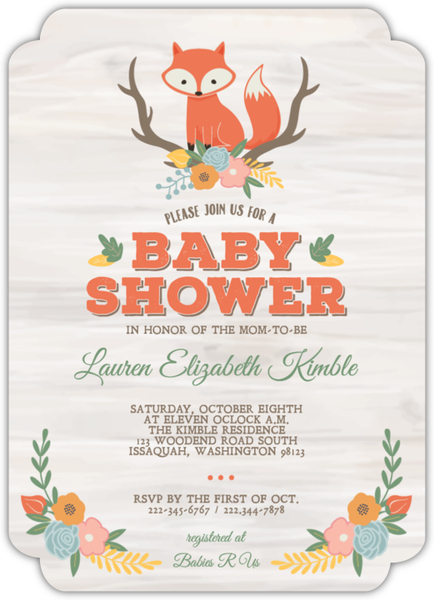 This cute fox baby shower invitation is a beautiful combination of soft colors that blends nicely with blue/green hues yet still keeps a fall feel for fall baby showers. This autumn season, it’s not all about brown and orange leaves. Just because the weather is changing it doesn’t mean you have to sacrifice your greenery. The greenery trend is taking center stage in the form of succulents, lambs ear, magnolia leaves, and herbs. 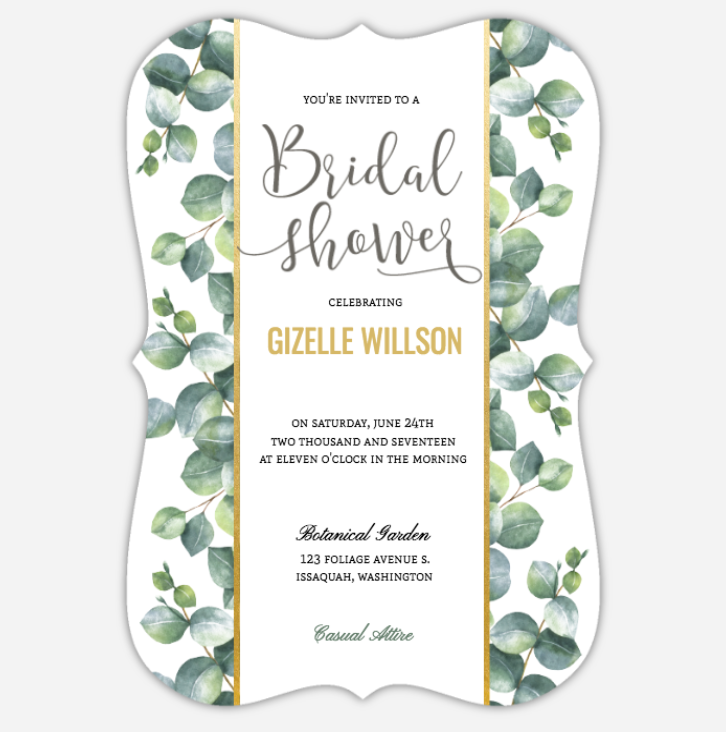 Greenery Watercolor invitation by PurpleTrail. 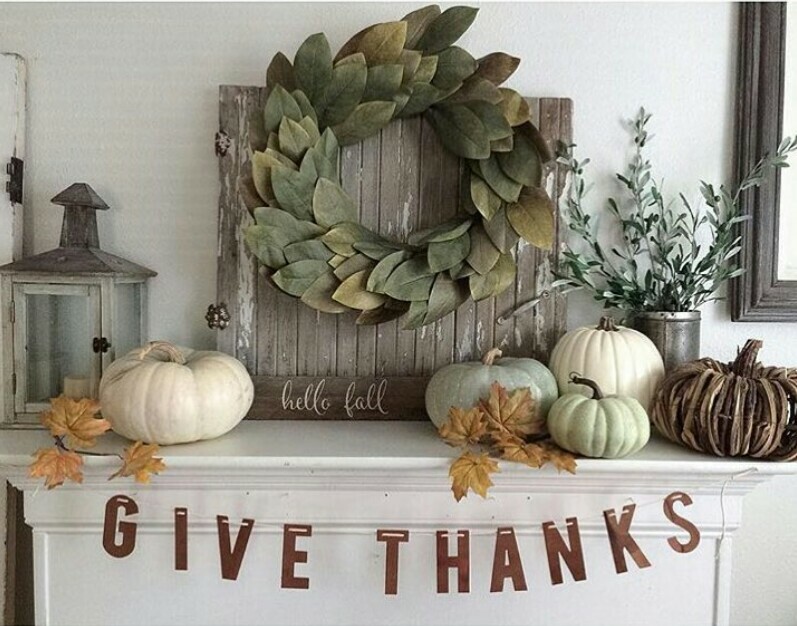 Fall mantel decorations via Pinterest. 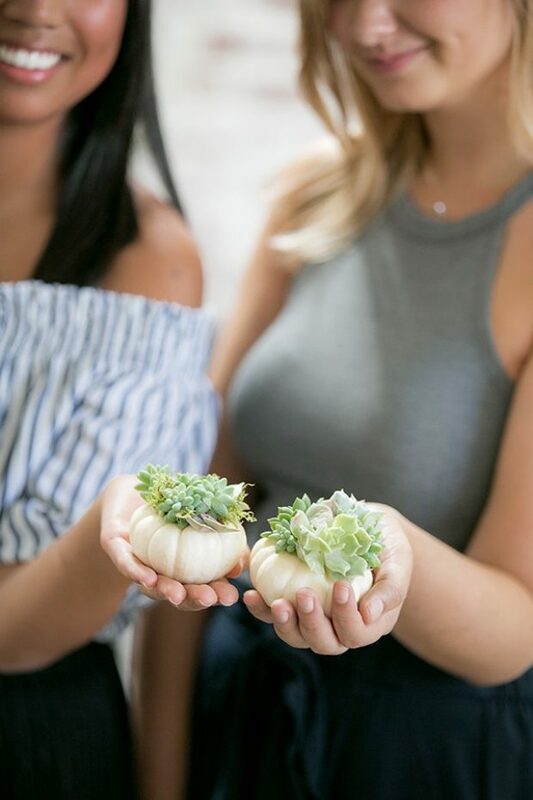 This succulent pumpkin craft was included in a modern, fall themed baby shower and featured on Sugar and Charm. They would also make adorable placeholders for a table setting for a fall themed party of any kind. 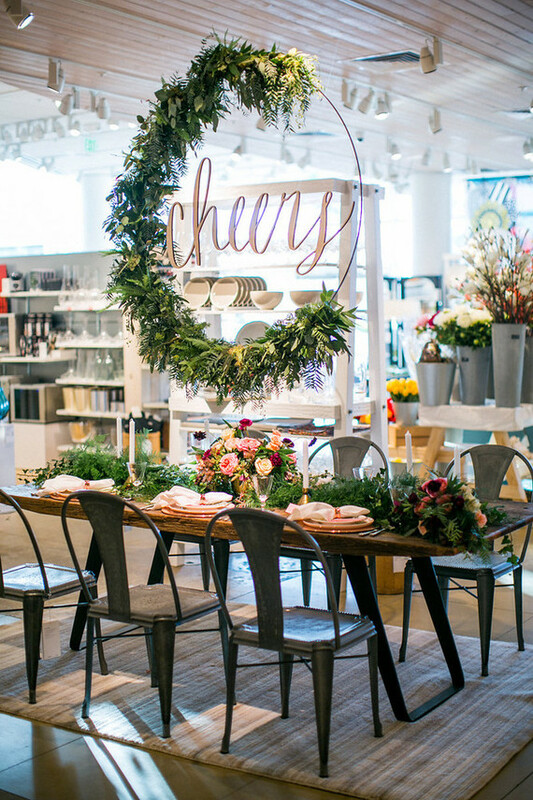 Speaking of greenery, we’re loving the hula hoop wreath trend as a photo backdrop, chandelier or simply a focus piece covered in greenery at your next party. Check out the DIY tutorial by All Things With a Purpose here. Via Casa de Perrin on Instagram. Adding wood elements to a fall party adds some organic texture to table settings, buffet tables and more. Round wooden chargers are a great way to elevate your tablescape with a autumn and rustic feel. 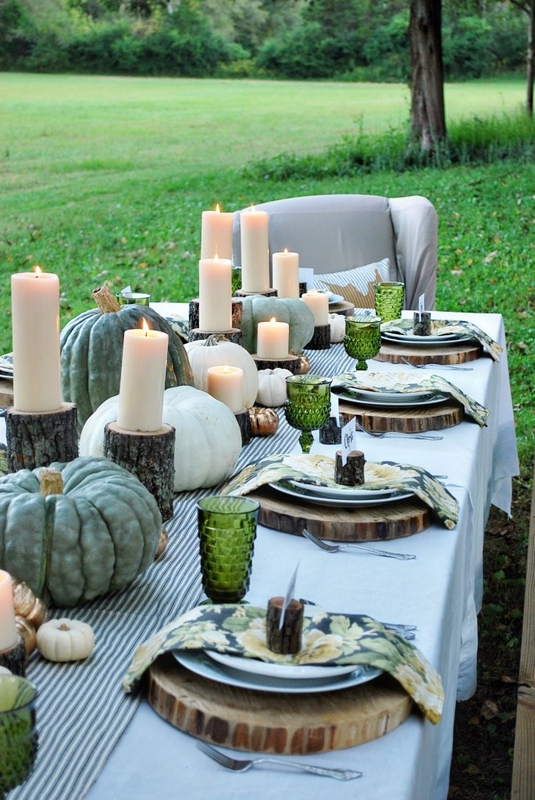 This tablescape is the perfect combination of cozy entertaining blended with fall decor. 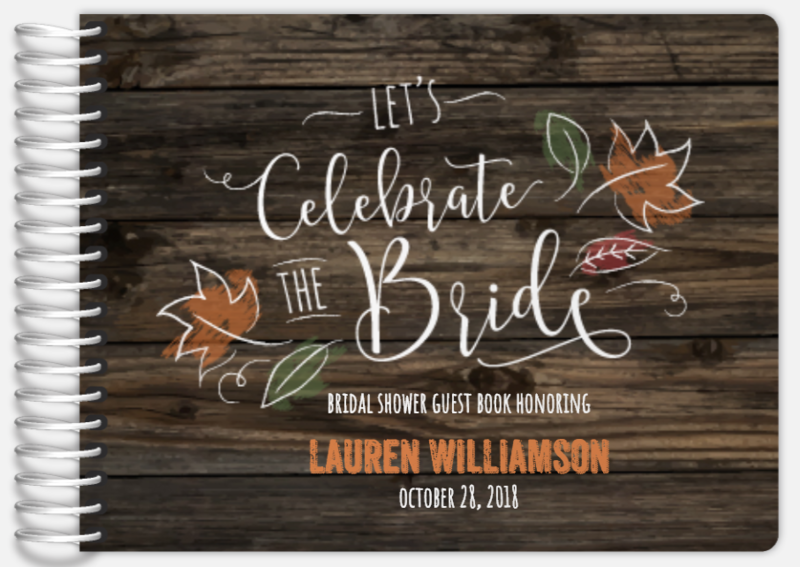 Fall Leaves Lumberjill invitation by PurpleTrail. 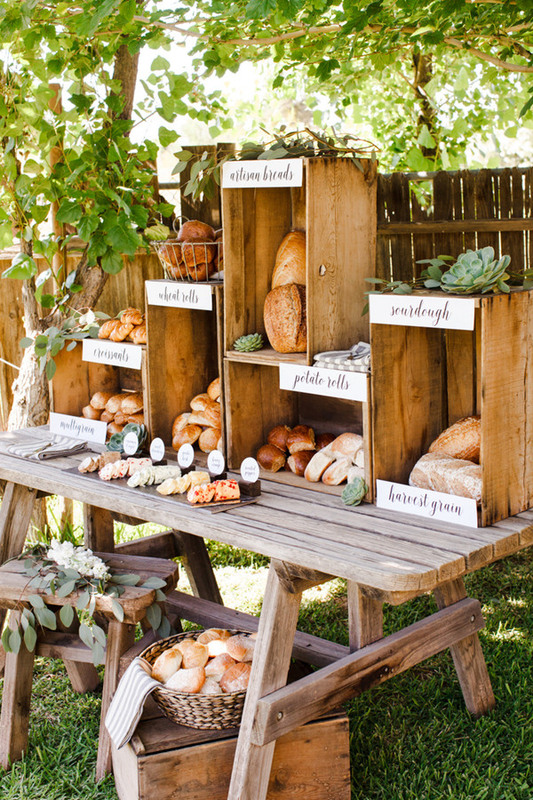 This bread and butter bar featured on Tulle and Chantilly uses rustic picnic tables and apple crates to provide depth and dimension for a buffet and would look amazing at any fall theme baby shower or bridal shower. 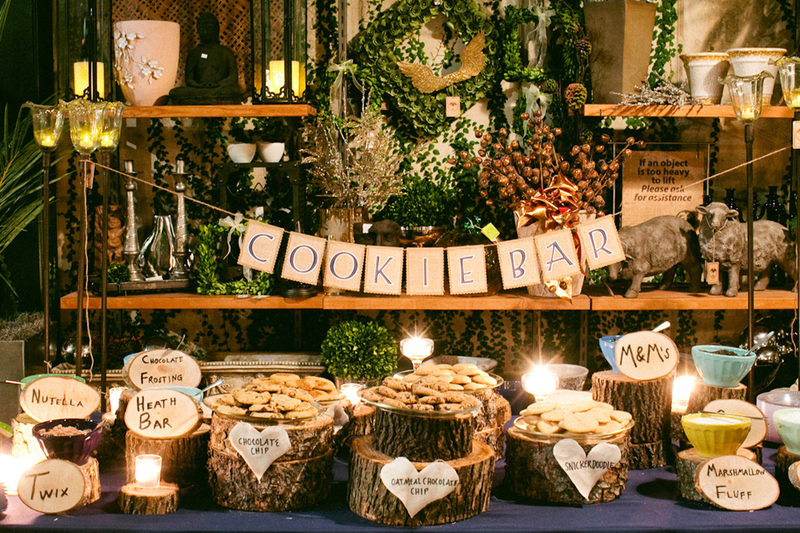 The cookie bar also feature on Tulle and Chantilly also creates a casual fall theme using wood rounds to add height and interest to the dessert bar. Don’t forget to add a guest book to make sure you’ll remember who was present at your party for years to come. PurpleTrail guest books can be completely customized to match your fall decor and/or invitations. This one picks up the wood theme can can be used for a baby shower, bridal shower, retirement party or more. Custom bridal shower guest book by PurpleTrail. Remember when pinecones were just for Christmas? Well not anymore. Pinecones are making their way into fall arrangements and decorations for fall parties of all kinds. They blend well with autumnal colors and provide an interesting texture against all sorts of fall based plants including sunflowers, greenery, dahlias and more. 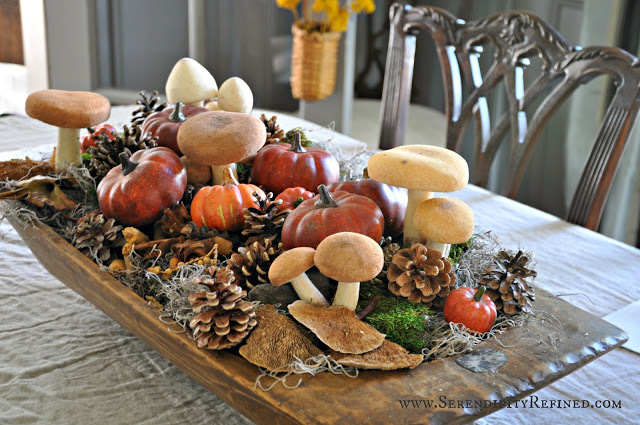 This centerpiece by Serendipity Refined features mushrooms, pinecones and pumpkins in a vintage wooden trough to welcome guests for fall festivities. 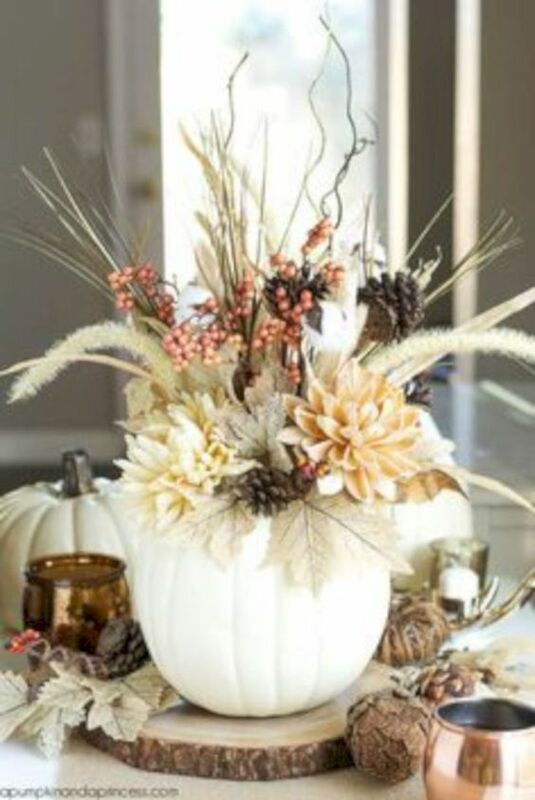 Fall centerpiece by Serendipity Refined. 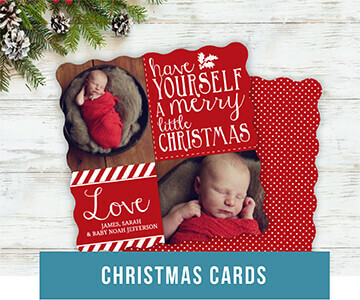 Pinecone Baby Shower invitation by PurpleTrail. 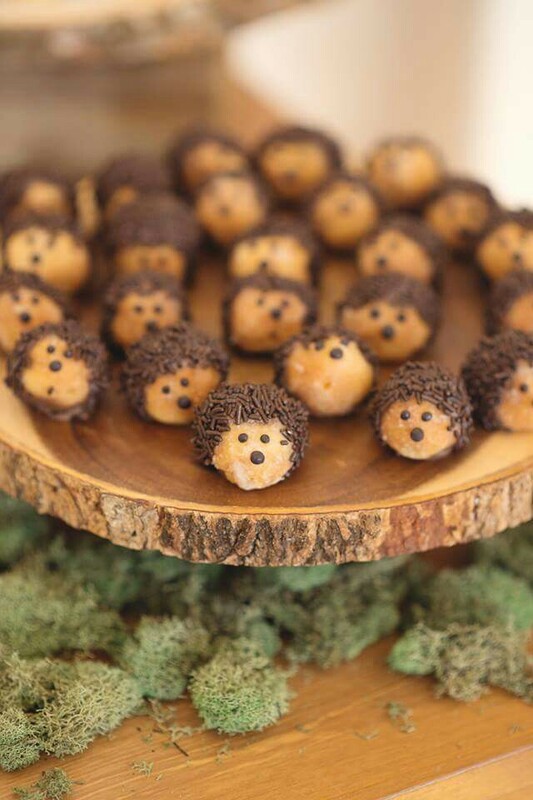 Popular themes for fall baby showers – and even bridal showers – include a variety of woodland creatures from hedgehogs, to foxes and raccoons. 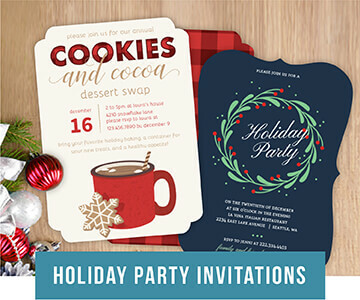 Their furry warm colors blend well with a fall color palette and make for adorable imagery on an invitation. 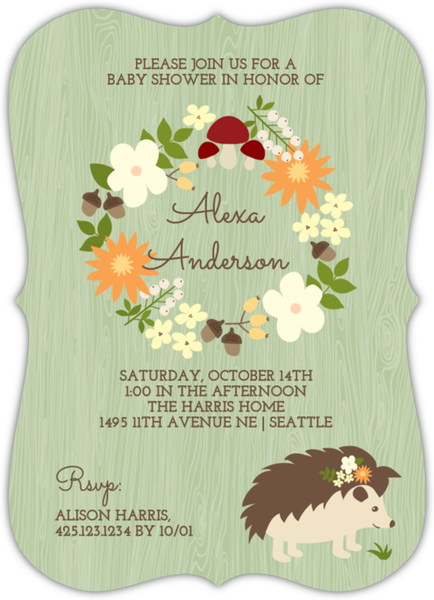 Woodland Hedgehog Invitation by PurpleTrail. We’re crazy for these hedgehog donut holes created with store-bought centers applied with chocolate jimmies and a frosting face. Donut hole hedgehogs via Pinterest. 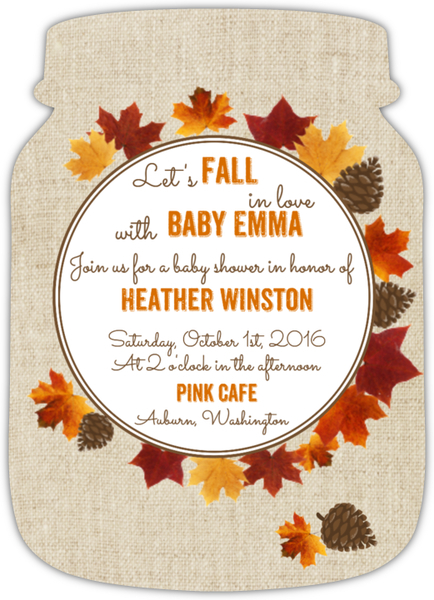 The woodland theme for fall baby showers is a great one as it’s perfect for boy, girl or gender neutral. This fall shower created by I Love Love Events features woodland creatures, including faux taxidermy busts that could be included in nursery decor later. 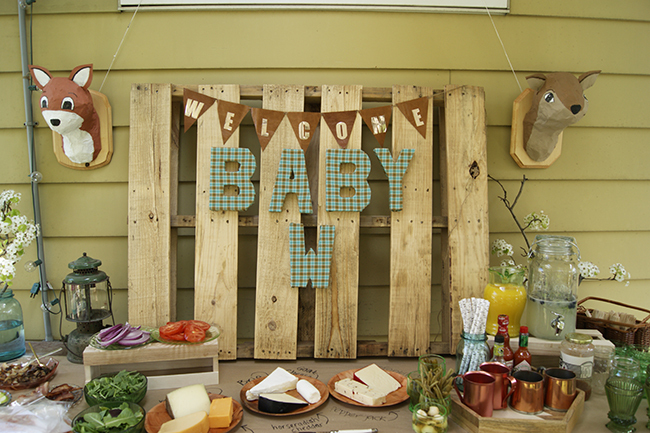 Woodland themed baby shower by I Love Love Events. Although the weather has cooled off, many parts of the country still have weather warm enough to take advantage of outdoor dining and entertaining. If you live in parts of the country that allows for it, make your fall party and indoor/outdoor affair. Meals can be hosted on a deck or patio or in a garden. The fall colors of turning foliage will provide the perfect nature’s backdrop for a fall event. Outdoor lighting and lots of candles will bring a warmth to outdoors and don’t forget to add a stash of blankets or throws nearby in case it gets chilly. And not all fall parties need traditional autumnal color schemes. This photo shoot setting for a new product line and profiled in Lonny Magazine would be such a cozy fall celebration with blankets, warm pillows and refreshments. Fall picnic photoshoot via Lonny Magazine. 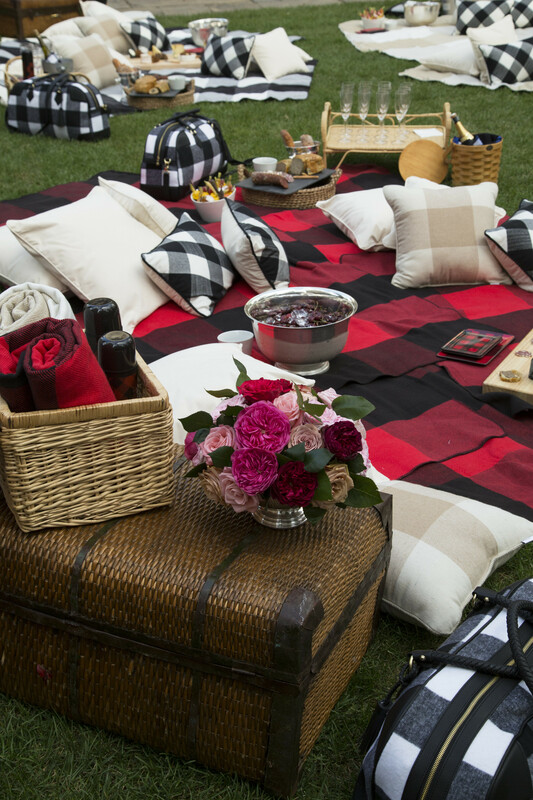 The black and white and black and red plaid accents are perfect for fall and coordinate well with lumberjack and lumberjill events. 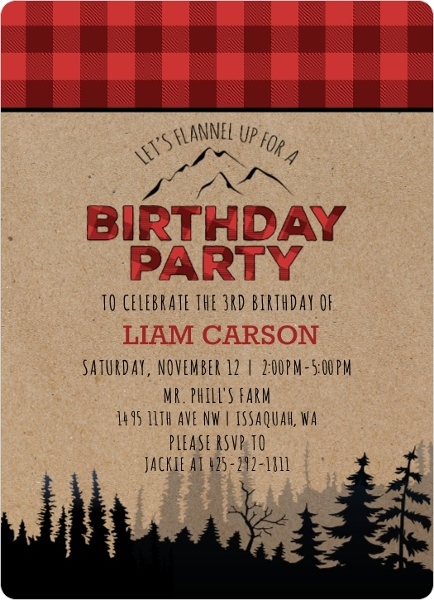 Lumberjack birthday invitation by PurpleTrail. 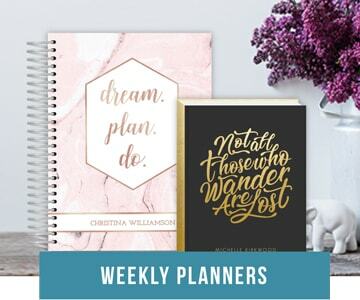 However you choose to celebrate and decorate your fall event – fall baby showers, fall bridal showers, fall birthday parties or other fall celebrations – the most important components are the friends and family in the room. Create a cozy space and enjoy spending time with those you love!